A day late, but oh well. Feb 26, 1979: Those of us who stood in the Moon's shadow in Northcentral Montana that day will never forget those brief two minutes. 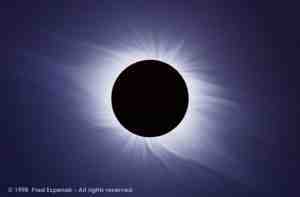 Actually, this photo is of the Feb 26 1998 eclipse over South America. Visit the Eclipse Home Page for information on eclipses past and present.